Upper limit on speed ? A friend of mine told me that there has been found examples showing that it is possible to find speed higher than the speed of light. As long as I can remember I have believed that the speed of light, c, is a nature constant and that the speed of light in vacuum is the highest possible. I will be happy to know if this is correct. Is it possible to find observation that can only be explained if it is supposed that what is observed is an object , particle, wave .. having a speed higher than the speed of light. …According to special relativity, the energy of an object with rest mass m and speed v is given by γmc2, where γ is the Lorentz factor defined above. When v is zero, γ is equal to one, giving rise to the famous E = mc2 formula for mass–energy equivalence. 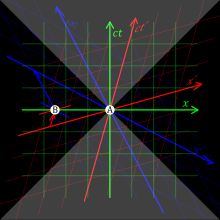 The γ factor approaches infinity as v approaches c, and it would take an infinite amount of energy to accelerate an object with mass to the speed of light. The speed of light is the upper limit for the speeds of objects with positive rest mass. This is experimentally established in many tests of relativistic energy and momentum. Sense – fornuftigt. At det er sagt af en der arbejder fra 8 – 16. Sense is if it is said by one who is working from 8 to 4. Nirvana today in hundred years ago. On the other side of the future we began to slowly move forward to the destiny of the planet. Rumors told on the second floor that the inhabitants down on the Saturn was encrypted by quantum units belonging to Napoleon for hundred years ago. Meanwhile we found hundred and nine psychoes with both hands on the crown executed to a tremendous scream of happiness as the were buried on the surface of the beautiful doorstoppers to Heaven. We do not deserve to die said the psychiatrists and we laughed in such a long time never-ending happiness as freedom for us zombies united in pure soft silk dresses as seen in Hollywood. We have won the fight over normality. Now everything is possible and we will live in happiness in the last years of total erasion of the men in white dress for hundred years ago. Now we are standing hand in hand for thousand years ago in conjunction with disarmed slowfoxers dancing with ruins of World Wide Web. On the book of Palms is whispering sweet soothing dreamworlds for the young 100 years old virgins with feet as elefants. The B&O toy shows the wonderful piece of art as the arctic ice have filled our luxurious homes of white grass inhaling tons of grey tobacco clouds in front of my neighbors two dogs underneath the bed of total sweepstakes. Nanette les we have found peace in the temple of dead psychiatrists filled with stones and brilliant football armies. Help my empty mind to fill in the gap between the overlasting pleasure in total surrounded silence in empty nothingness. Here we are together with the disciples of Buddha and Thor embracing my room of everything. Over the rainbow there was a new story about the rules of chess written with blood on the B&O. The double so deep disk wheels up with champagne as an endless stream by Netflix. Bill Gates died in poverty alone and poor as a church rat. The WWW has closed down for thousand years ago and only you and me are survivors. What the Hell shall we putt up now you and I say in the mouth of each other. Where shall we go now when there is no now and past and future. What is the next step towards the old good times. All is one and One is Two and the Einsteins is begging for mercy. The Book of Palms continues to spread out air in the filled emptiness. Go on and continue. Look up and look. See if you can stand it. No TV. No Computers. No Ships. Only happiness.